Enter your e-mail address below to obtain your free Audio Rosary and/or Divine Mercy Chaplet. You will be directed to a separate download page. Going forward you will receive our newsletter, and are free to opt out. Also available for download is the pdf special report: Evidence of the Supernatural. The audio is in mp3 format. You can use any audio player. We recommend AudiPo. It allows you to speed up or slow down the tempo, and bookmark key spots. Reciting the Rosary aloud or to yourself is wonderful, but sometimes distractions and interruptions make that hard. This is especially is true while driving, exercising, or in a busy or chaotic setting. In those cases it’s helpful to listen to a recording of the Rosary. That is easy to do with your smartphone. Thanks to the audio Rosary, you may be able say a lot more Rosaries than you otherwise would. That can only please Blessed Virgin Mary! The same is true for the Divine Mercy Chaplet. Seventimes70 produced this audio Rosary featuring Sylvia Dorham, a professional voiceover artist whose credits include EWTN radio. Playing in the background is a soothing rendition of Schubert’s Ave Maria (arranged and produced by Steve Sulkin via Pond5.com). 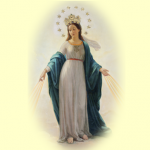 Included are all four mysteries of the Rosary – Glorious, Joyful, Sorrowful, and Luminous.